The HP Colour Laserjet CP3525X is designed for small business, producing professional quality documents. This affordable and reliable networked printer offers automatic duplexing which allows users to print on both sides of the documents and decreases the paper cost. The printer uses HP ImageREt 3600 technology to reproduce colours and to enhance images. The printer also offers high capacity HP Colour Laserjet CP3525X toner cartridges which yield up to 10,500 pages, reducing the need to purchase the refills repeatedly. The printer weighs around 40.5 kg and measures 51.30 x 49.02 x 52.07 cm respectively. It has a neatly designed control panel with different control buttons. The input tray of this device can handle up to 250 sheets of paper, which can be further expanded up to 500 sheet tray, while the output tray can store up to 250 sheets of paper. The 100 sheet multipurpose tray can handle different forms of print media which include cards, transparencies, recycled paper, envelopes, plain paper, labels, and glossy paper. The HP Colour Laserjet CP3525X runs on 515 MHz processor and 512 MB of RAM. 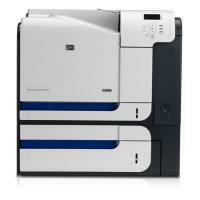 This colour laser printer has a printing resolution of 1,200 x 600 dpi with print speed up to 30 ppm. The printer is capable of printing up to 75,000 pages on a monthly basis and will meet the demands of a busy office. The printer supports memory expansion slot which will allow users to increase the RAM up to 1 GB. The HP Colour Laserjet CP3525X printer meets the demands of busy workgroups and produces professional quality documents. The automatic two-sided printing feature allows users to save on paper cost. It also offers memory expansion slots, allowing users to upgrade the RAM up to 1 GB. The printer has four ink system for its HP Colour Laserjet CP3525X toner cartridges, that are available in 2 capacities. However, it lacks scanning and copying features and wireless printing capability which are the major features that many consumers look for and is found in almost all the other printers lying in the same range. How to resolve toner smears issue of an HP Colour Laserjet CP3525X printer? It is normal that after some time the HP LaserJet printers start showing some print quality issues like smears, smudges, blanks or ink spots etc. These things can either be the result of low level or faulty HP Colour Laserjet CP3525X toner cartridge, poor quality/damaged sheets or may be blocked printheads. However, you should not worry about such issues as they can be resolved easily without any professional assistance. Try installing a new HP Colour Laserjet CP3525X toner cartridge. If the problem wasn’t caused by the print media, it might be the issue of a faulty toner cartridge. Replace the HP Colour Laserjet CP3525X toner cartridge and try making prints. Q. If I purchase HP Colour Laserjet CP3525X printer for my small business, will I need to purchase cartridges repeatedly? A. The printer offers high capacity HP Colour Laserjet CP3525X toner cartridges which yield up to 10,500 pages and reduce the need to purchase the cartridges repeatedly. Q. I need to take printouts on regular basis for my business work. Is there any printer available that offers automatic duplex-print feature? A. The HP Colour Laserjet CP3525X printer has an automatic duplex-print feature which allows you to take print on both sides of the paper, thus eventually save a lot on your paper cost. Q. I’m looking for a budget-friendly printer for my small office usage. Can you suggest me one? A. You can look forward to HP Colour Laserjet CP3525X printer. It is simple in design and intended to use for office purpose. The printer is low in cost as compared to other printers of the same range, which makes it cost-effective in nature. It is easy to use and support duplex printing. Also, the high capacity HP Colour Laserjet CP3525X toner cartridges yield upto 10,500 pages, reducing the need to purchase the cartridges repeatedly. Q. What cartridges can be used for replacing HP Colour Laserjet CP3525X toner cartridges? Q. What is the print speed and printing resolution of this printer? A. The printer can print upto 30 pages per minute and 75,000 pages on monthly basis. The printing resolution is 1,200 ✕ 600 dpi. Q. What is the paper tray capacity for input and output trays of HP Colour Laserjet CP3525X printer? A. The input tray of this device can handle up to 250 sheets of paper, which can be further expanded up to 500 sheet tray and the output tray can store up to 250 sheets of paper. Q. What is the maximum thickness of labels I can use for printing in HP Colour LaserJet CP3525X? A. For labels the maximum thickness and stack height supported is 0.102 mm and 10mm (0.39 inch) respectively. Q. Do compatible HP Colour LaserJet CP3525X toner cartridges provide print pages as much as the genuine ones? A. Certainly. With the standard usage considered (5% page coverage) the compatible toner cartridges will last as much as the genuine cartridges. However, the yield also depends on your printing needs and the printer settings. Q. I have recently purchased HP LaserJet CP3525X. Whenever I try printing I get wrinkled printouts. What could be the reason? A. First and foremost, please ensure the paper you are using is compatible with the product. Make sure the product is used in less humid environment. Load a fresh paper in the input tray. Go to Print Quality menu > Paper Curl option > Reduced. This will decrease the full speed to 10 ppm and a quarter speed to 7.5 ppm (increased speed may also cause this problem). Also, a paper that is damaged, damp or reused may also cause the problem. Q. I urgently require HP Colour LaserJet CP3525X toner cartridges. I live in UK. If I place the order today when will I receive it? A. Be it HP Colour LaserJet CP3525X toner cartridges or any other print cartridge for that matter, almost 90% of the orders are delivered the same day if you place the order before 12pm depending on the availability of the stock. Please note that all our products are delivered through Fastway Couriers. And, they deliver orders everyday between 9am to 5pm excluding Saturday and Sunday. Our services are currently available across UK and Ireland. For urgent requirements you can call us on 048 30833221 to confirm the availability of the product. We will be happy to help you. Q. How to resolve toner smears issue of an HP Colour Laserjet CP3525X printer? The toner smears on the leading edge of the printout indicate the sheets to be dirty. Wipe the media guides and input sheets with a dry and lint-free cloth and try taking the print out again. Make sure the sheets are placed properly in the input tray. Try replacing your HP Colour Laserjet CP3525X toner cartridges with a newer one and see if the problem persists. Check the fuser temperature in the printer’s properties. Low fuser temperatures cause such print smears to occur. Q. I am getting poor prints on using the compatible HP Color Laserjet CP3525X toner cartridges, what could be the reason? A. Check the paper quality. When the paper is too moist, too rough, too smooth or too heavy, such problems do arise and these would arise even on using the original HP Colour Laserjet CP3525X toner cartridges. Try changing the paper quality. Do not worry, this problem has nothing to do with the compatible or original toner cartridges. Q.The print is blank, I have just installed my new compatible HP Colour Laserjet CP3525X toner cartridges, am I facing this problem because it is not original? A. A blank print out comes when the sealing tape has not been removed from the new cartridges. Remove the seal from all the cartridges and get your prints. You may face this issue even while using the original one’s. Q. Will the ink dry up if I purchase in bulk? A. The toner cartridges can last up to 6 months if the seal is left intact. One can buy the cartridges in bulk and use them as and when required. Q. HP is branded as one of the best in laptops, can one find the same quality with its printers too? A. We do not sell the printer on the site. However, we know that HP printers are the best in the industry and have created a mark for themselves in the printer industry. Very reliable and easy to use, they lead the market in printer sales. The small errors or problems which may crop up can be easily rectified using the online guidance provided by the HP website. Q. Will I get a refund guarantee in case I am not satisfied with the printer as I do not want to risk losing any money? A. We assure you that you will never regret buying cartridges from our site as the compatible cartridges we provide are first tested and then supplied. Even though if you face any issue we provide 100% money-back guarantee for the customers who are not satisfied with the product. As Customer satisfaction is our highest motto. This proves the authenticity of the product. Q. Can I refill the HP Colour Laserjet CP3525X toner cartridges and for how many times before replacing it? A. It is advised not to refill the toner cartridges on your own as it can be dangerous to your health. The compatible ones are easily available at low cost and it is suggested that one should go for the compatible ones rather than trying to refill. Q. Can I do bulk buying of the cartridges and store them without getting into the trouble of dried up cartridges? A. If you require heavy printing on the daily or weekly basis, it is recommended to buy the cartridges in bulk as this would reduce your buying cost and also reduce your printing expenses drastically. Just make sure that the seal is left intact. Q. I am getting dis-aligned printout, what could be the reason for such issue?